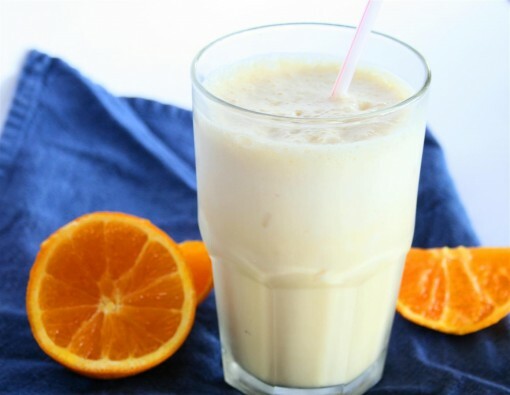 Healthy Vegan Orange Julius was posted on July 27th, 2011 and is filed under Dairy Free, Drinks & Smoothies, Gluten Free, Kid Friendly, Recipes, Vegan. This entry has 31 comments. You can follow any responses through the RSS 2.0 Comment Feed. Do you ever walk through your mall when you’re starving? It’s a dangerous condition to shop through, believe me. I cannot shop hungry or I feel like I will either collapse on the spot or claw someone till I’m fed. Which is why I’m grateful that most mall food courts have one or two healthy places that save my life. Sushi joints and smoothie shops are my favourite. But there are some smoothie places that really don’t serve the healthiest drinks, even though they look healthy. Take Orange Julius. I love that place and they have some great, healthy options, but their signature Orange Julius isn’t so hot. Guess what’s in it? 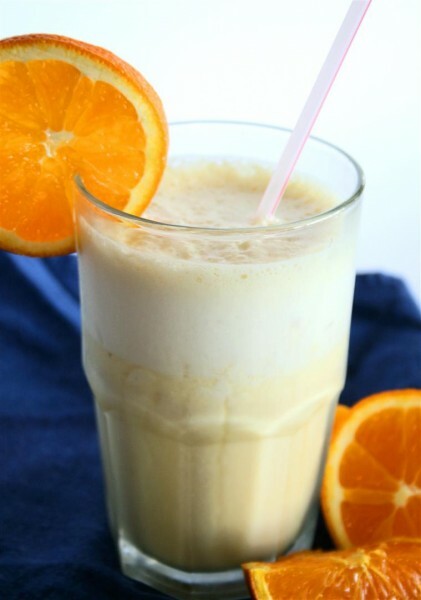 One large Orange Julius has 700 calories and 110 grams of sugar! Their small version isn’t as bad, but it still 350 flipping calories for a tiny serving. I made my own and I think it tastes just as great. It’s got all that lovely orange foam I heart. It’s vegan. It has 63 calories for a glass. And it’s actually GOOD for you. It’s high in vitamin C, vitamin A, vitamin E, potassium, calcium, and really low in fat and sugar. This is a great way to serve orange juice to your kids in the morning or for a refreshing cold drink in the afternoon! Serves 3. Blend everything up in your high speed blender and pour into two glasses. What’s your favourite summer time beverage? How are you keeping cool in this hot weather? Wow, that’s quite a calorie reduction! These look so refreshing–perfect for summer. Gr8 idea! Gonna fix it tomorrow morning:-) Yum-yum-yum! i never thought an orange smoothie can look tasty and be healthy at the same time. i am loving this drink! Mmmmm I make this one all the time!! SO good! What a nice lovely blog here, Thank you charissa for stopping by. Your blog aim is woderful , so expect me to stuck by, just subscribe to be updated. 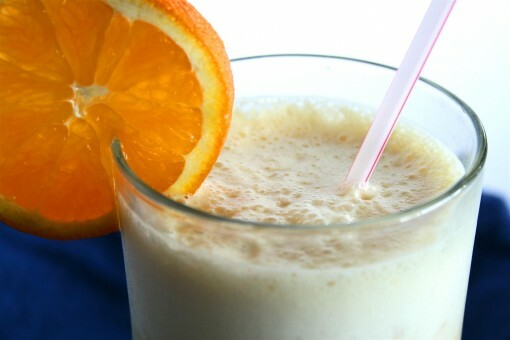 This smoothy looks very delicious plus it’s healthy, sure will try once I have some fresh oranges. Oooh I am definitely going to have to try this. And it is so low in calories! Thanks for stopping by the blog. Come again soon! I love your healthy remake of this classic drink! It’s one of my favs, and I would feel great about having this healthy version any time! All your healthy recipes and posts are so inspiring! This looks super scrumptious and perfect for summer. Yum! That looks insanely easy and insanely delicious! I need to try this ASAP! This looks great for summer. I love almond milk and am about to check out your homemade recipe too! Wow. That looks amazing. I might have to surprise my boyfriend this a vegan orange julius tomorrow. He’d love it. This looks fantastic. My wife was craving an orange julius and this was the best one we found! Thanks! Yum! I just made this for my 2 year old daughter and me. I added a few extra ice cubes and 1 tablespoon of honey. We both loved it! could l just use a fresh orange instead of oj concentrate? Mmmmmmm!!! My four kids had their very first orange julius and LOVED it! What a great healthy version, we juiced our own oranges and it was perfectly sweet! I just made this (juiced oranges then mixed up in the Vitamix) and it does not come out very well with only 1/2 cup oranges. There was way too much almond milk compared to the juice. I had to juice 2 additional oranges to total 1 cup orange juice, then I had to add some Stevia because it still didn’t taste very good! Amber – The recipe calls for orange juice concentrate, which is a small amount of OJ, but loads of flavour. I haven’t really tried making it your way…but I know if you use the concentrate it will be really sweet with any need for added sweeteners.